People always smile when they see the kids and I heading to school. 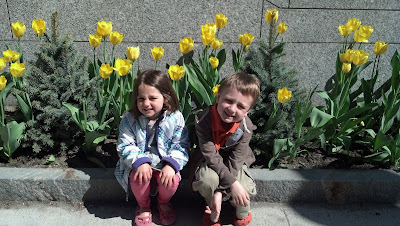 Between the daffodils and these hysterically cute kids, how could you not smile?! 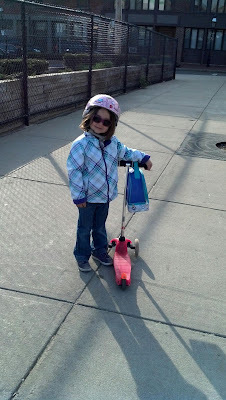 Just a normal day scootering to school! As if the two Bruins games and one Red Sox game wasn't enough for one week, I got the boys Celtics play off tickets. Yes five professional sporting events all in a week! They wore their green, cheered, and in overtime the Celtics won! A nice mass then a sugar filled brunch to start of Chris's birthday-day. 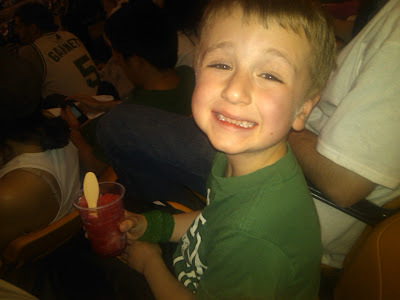 The boys then went to the Celtics playoff game and the girls made brownies. Angela had two hearty servings of chocolate by nap time and a third after a nice lobster dinner. That girl knows how to celebrate! 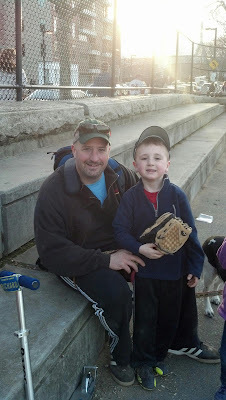 Although Rich has had baseball practice, today was the official opening day of the season. It turned out to be one of those perfect New England Spring days and we got to spend it on the water (because that is where our ball fields are located). We spent over five hours down there. Rich played his game, watched his friends games, played on the playground, had some pizza then played some more. And he did amazing!! 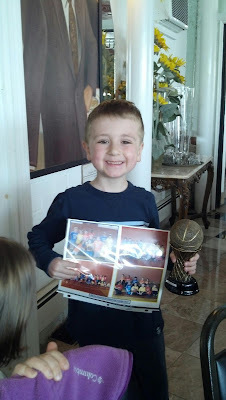 His league is for 6-8 year olds so he is one of the youngest on the team, but by far one of the best. He went 3 for 3 and made some great plays getting kids out at first base. Parents were coming up to Chris after the game commenting on how good he is. The group picture is of the Muckdogs that are in Ms. Hutchins Kindergarten class. She was also very proud of them! These are the posts I like Chris to write because I wasn't at the game, but these hysterical pictures tell most of the story. This game was the "good seats" Rich had won at his basketball banquet. He talked about it for WEEKS and could barely sleep because he was so excited. They wound up upgrading to the tenth row behind the Astros on deck circle so he was even happier (if that is possible!). 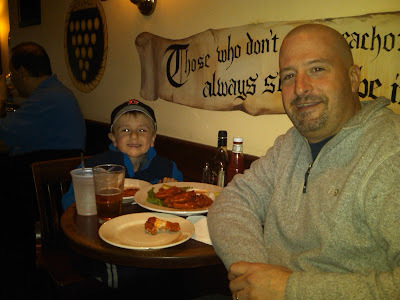 Before the game they hit Cornwall's for some wings because that is Rich's favorite food. The second picture is my all time favorite picture EVER. 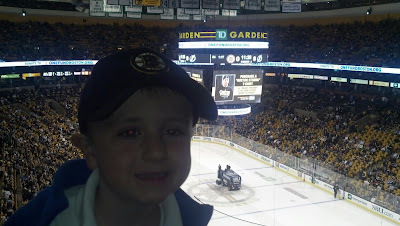 Two Bruins games in one week!! This is what Rich looks like out to dinner when there are TVs with sports on. 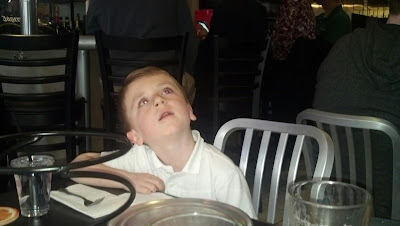 Chris had to feed him his pizza because he just stared at the TV. Red Sox on one TV and a soccer game on the other. Convenient for when the commercials come on! 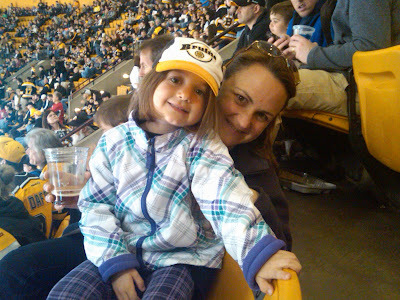 Bruins with my babies!! First of two games this week. My kids may be a teeny bit spoiled. It was so nice to wake up Saturday and get to celebrate the day with our good friend Maddie! Our dear college friends Kara and Mike's oldest daughter, and a special friend to the kids as well. Since they always spend their birthdays together they actually think they are cousins. So cute! Just when I thought we were getting over all of this craziness Friday happened. We weren't going to let this get us down again so we made the best of this "snow day" without the snow. We let the kids watch cartoons and play on the iPad for the morning while Chris and I tried to figure out what the heck was going on. When it was obvious it wasn't going to end early we just made the best of the day. 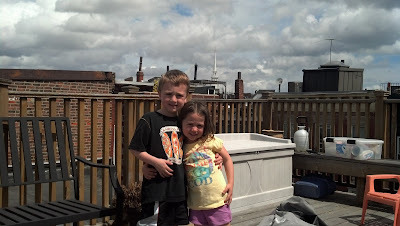 We played in shorts and t-shirts on the roof (it was 70 degrees out!) and had friends over for drinks. At night we had a dinner party with other friends who live nearby. Since we had circus tickets I had to tell the kids what was going on. They seemed pretty un-phased for most of the day, but I was VERY glad to be able to report that the police got the bad guys and put them in jail before they went to bed. Since concentrating and working was next to impossible after the events of Monday I decided to take Wednesday off and spend it with the kids. The best part was that we also spent the day with MaryBeth who is my friend who ran the marathon. I had been so worried about her, his husband and her girls that just seeing her face lifted a huge weight off of my shoulders. 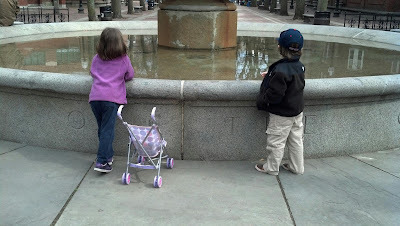 A day in Boston with friends was exactly what we needed. It was also a gorgeous day (although a little too nice because we all came home with a sunburn!) 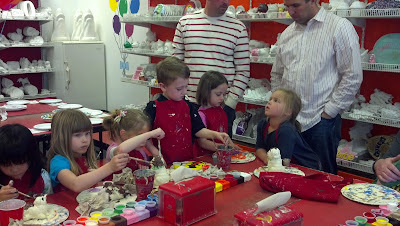 and so much fun as always. We played some tennis, basketball and went to at least 5 playgrounds. Took the T boat to Charlestown and just goofed around with friends. 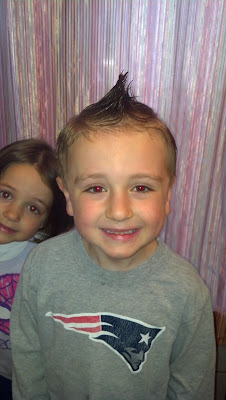 The kids could tell I was going to be a push over because Rich asked for a mohawk and I said yes! I have been dreading posting these marathon pictures because I couldn't do it without tears streaming down my face. What started as another one of the amazing activities my kids and I get to experience in Boston, ended being one of the worst days I can remember. This is supposed to be their blog, their baby book in a way. Do I really want to post pictures of this horrible event? The day my kids heard two explosions, saw smoke and then realized one of their friends Moms had just ran by us in that direction? But I need my kids to remember they were there. Remember they were strong. Remember bad things happen. Remember to stay strong. Spent a relaxing Sunday afternoon with my favorite little man. He is getting so big so fast it is hard not to see him every day. He is also a lot more fun for the kids because they can get him toys and make him smile. And Chris and I have the honor of being his Godparents. We couldn't be happier! These two are the best of friends but can also fight like an old married couple. Can't help but laugh at this picture as if it is foreshadowing the two of them in 20 years.....married with a kid! Our first Red Sox game of the season. Glad to be back at Fenway Park because that means it is Spring! And boy did it feel like Spring with the "April Showers" we experienced. That didn't stop us. 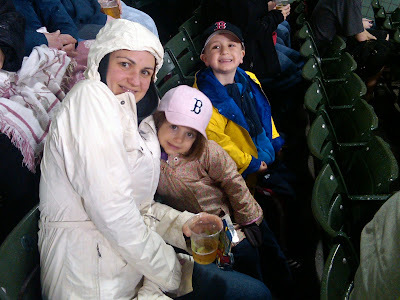 Although most people were under cover, we brought our rain gear and sat out 4 innings of baseball in the rain. 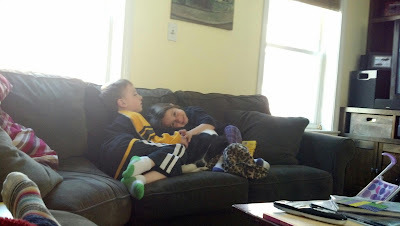 My kids are tough (and addicted to sports!). Notice Rich can't even look at the camera for a picture. 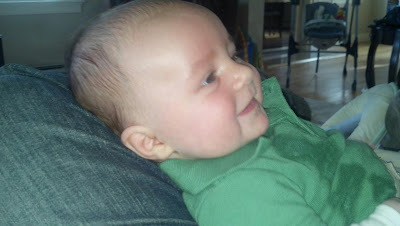 He is smiling at the camera, but watching the replay on the big screen. 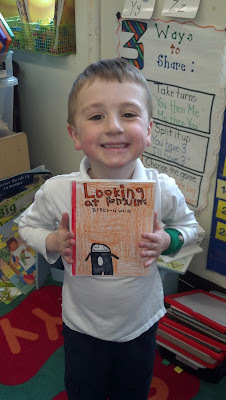 His very first published book! Rich and his class just finished studying non-fiction books. They each picked their favorite animal at the Aquarium and studied them on three different trips. They then wrote their books starting with a idea draft and finishing with a hard cover final product. I got a sneak peak at his this morning because I can't make it to their publishing party tomorrow at school (YES, PURE GUILT but I have to work!). He is so proud. I LOVE his school! 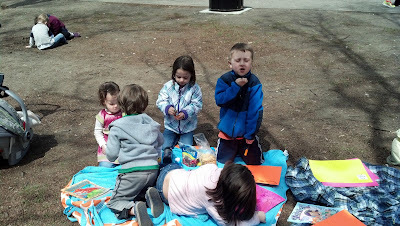 Writing "real" books and taking numerous trips to the Aquarium means the kids love school as well. 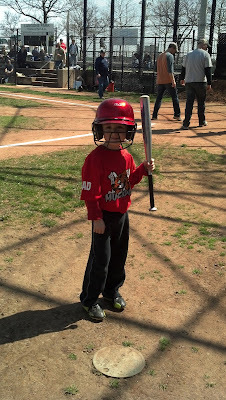 First Muckdogs minor league practice for Rich and Coach Chris! And one more trophy makes six! The last thing I want to do on a Sunday morning, but how can I say no to that smile? He just loves playing sports and still sleeps with each and every new trophy that he gets. AND he won a pair of Red Sox tickets.